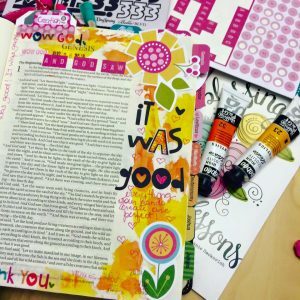 I’ve been Bible journaling on and off for about 20 years. 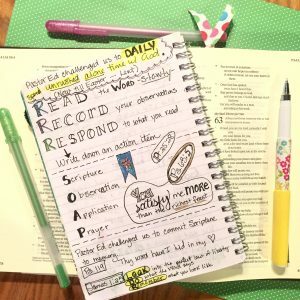 How did you get started in Bible journaling? 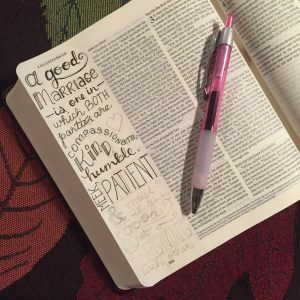 I was going through some tough times and needed to remind myself of how good God was. 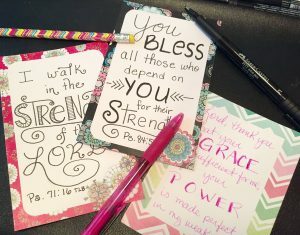 I started with just writing verses that touched my heart onto index cards. I’d put them on the kitchen window to memorize them. They carried me through. I wanted to remember what I was learning and started writing in a notebook. 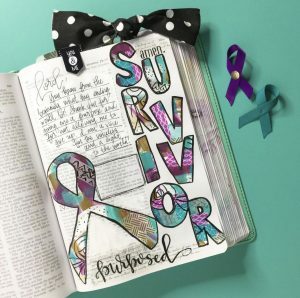 The words, “Bible Journal” never came to my mind. This was when I was a younger woman. Sometimes I have done specific studies and written my answers to the questions. I have gone back to those studies at times. There are a few that I want to look at in a deeper way. That I can look back at what I’ve written before I can see things in a deeper way. It encourages me as I remember various periods of my life. As I write I end up thinking of things that I hadn’t originally thought of. 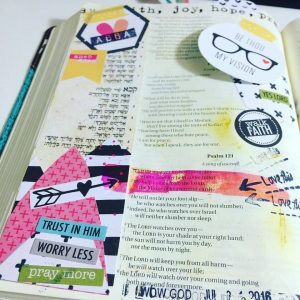 Most of my journaling is a mess. I start with writing line by line and then I find myself thinking of other things. I end up trying to write these things in the margins near where the original comment was. I also find myself writing at the top of the page with arrows going to the comment that is related. 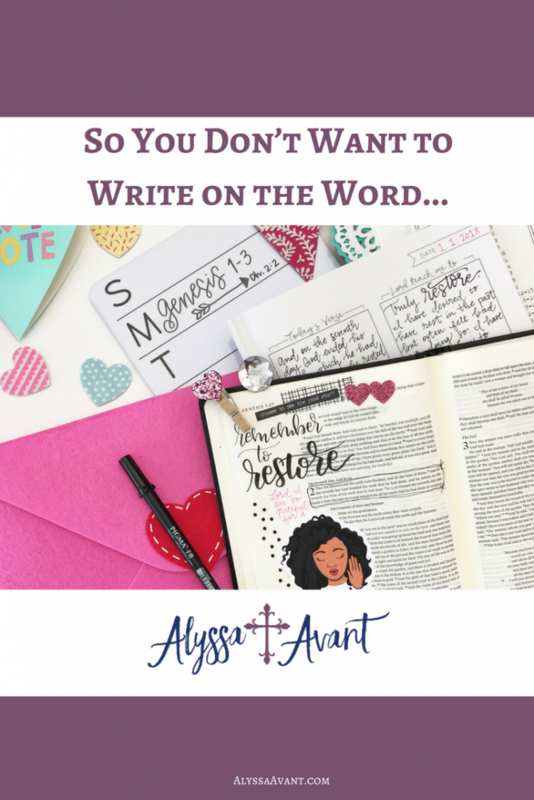 Years later, I have read what I’ve written and then I can see more clearly how God has worked in my life. It helps me to celebrate His goodness. My Bible. I recently bought one with larger print. 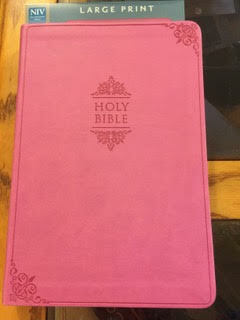 I was really struggling with being able to read my Bible. I know have a pretty pink one. Sometimes, I will different colored pens to spice it up a bit. 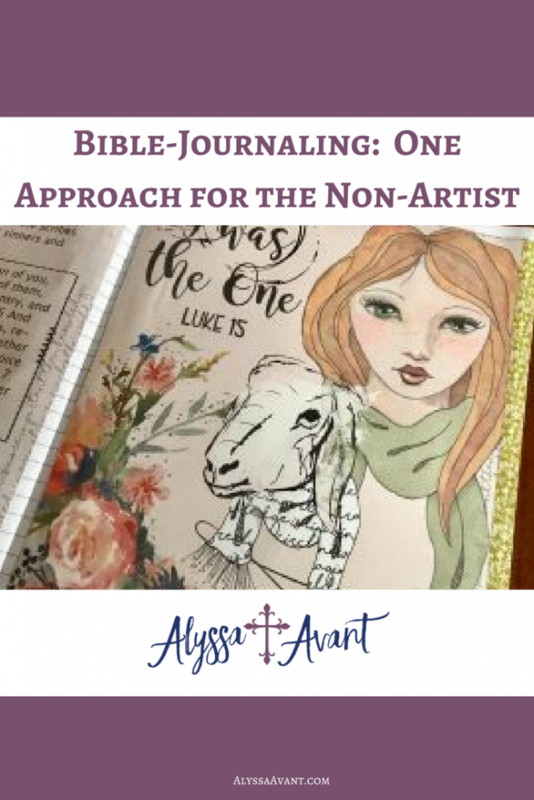 I also have a Bible for journaling. I haven’t started on that yet. 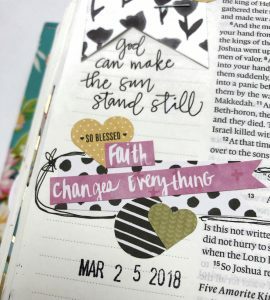 I have a chronological Bible that helps me when I’m unable to put the pieces together of what the timeline is. 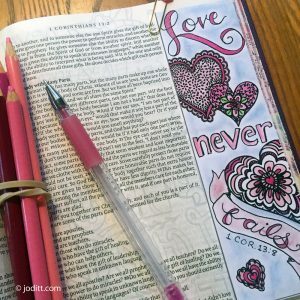 My husband bought me a journaling Bible. He also got a set of pens that don’t bleed through the pages with a 6-inch ruler. The dog got ahold of my ruler and chewed it up. I gave up until I could find another one, which I did recently. 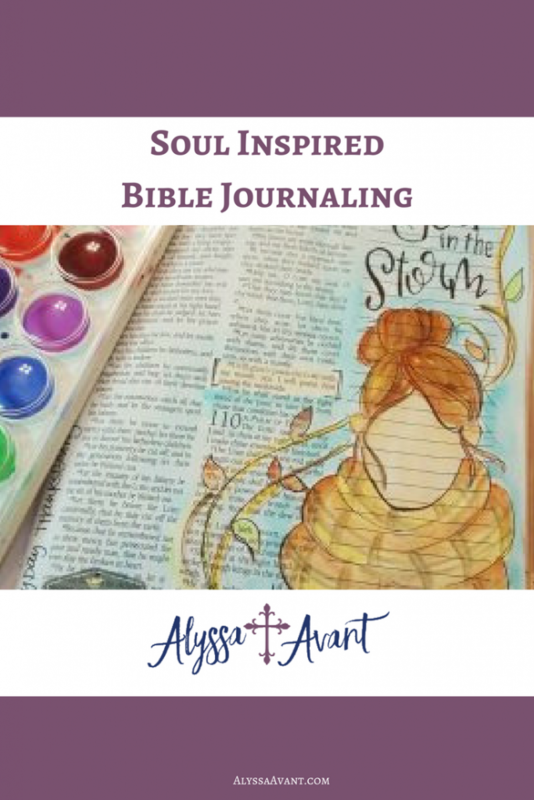 Most of my journaling has been in Bible study books or in a spiral notebook. I tend to want to be a perfectionist in these type of things. I have used the SOAP method for the last few years. And I really do like to go through Bible studies. 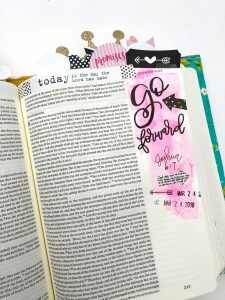 I think the method that I made up will become my, “go to.” I’m calling it the “5w’s & How.” At this time in my life, I think that it will help me to get into the Scripture in a deeper way. I would like to introduce you to Tamacca Harrison. 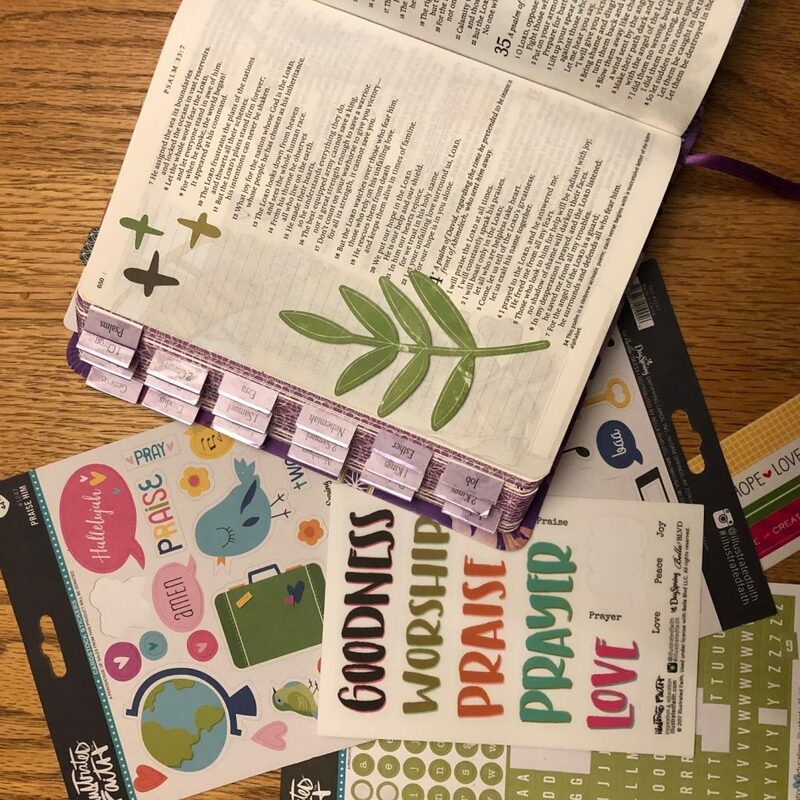 I found Tamacca on Instagram, which is my favorite platform for finding Bible Journalers. 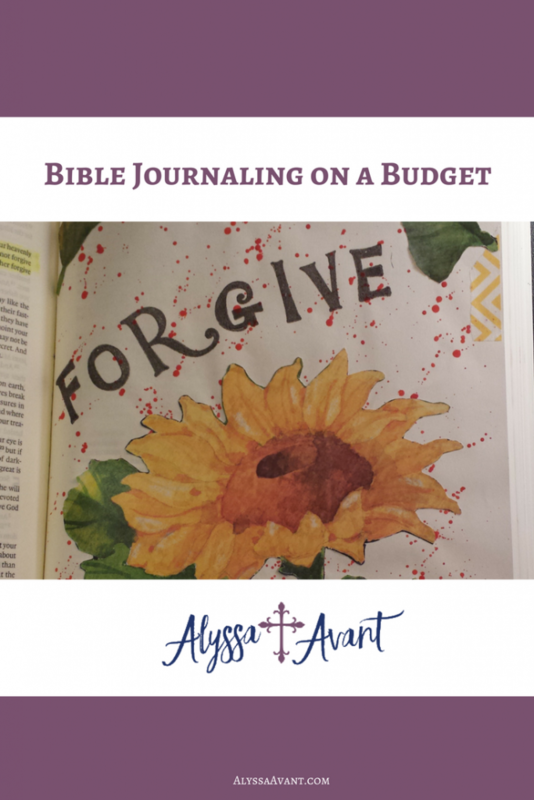 Her handle on Instagram is @biblejournalingonabudget, which spoke to me immediately because I am definitely a “budget-friendly” Bible journaler. 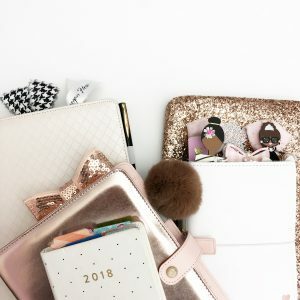 Though she doesn’t have a blog right now she has so many wonderful ideas that she shares on Instagram and on her Youtube channel so definitely, take the time to check those out. 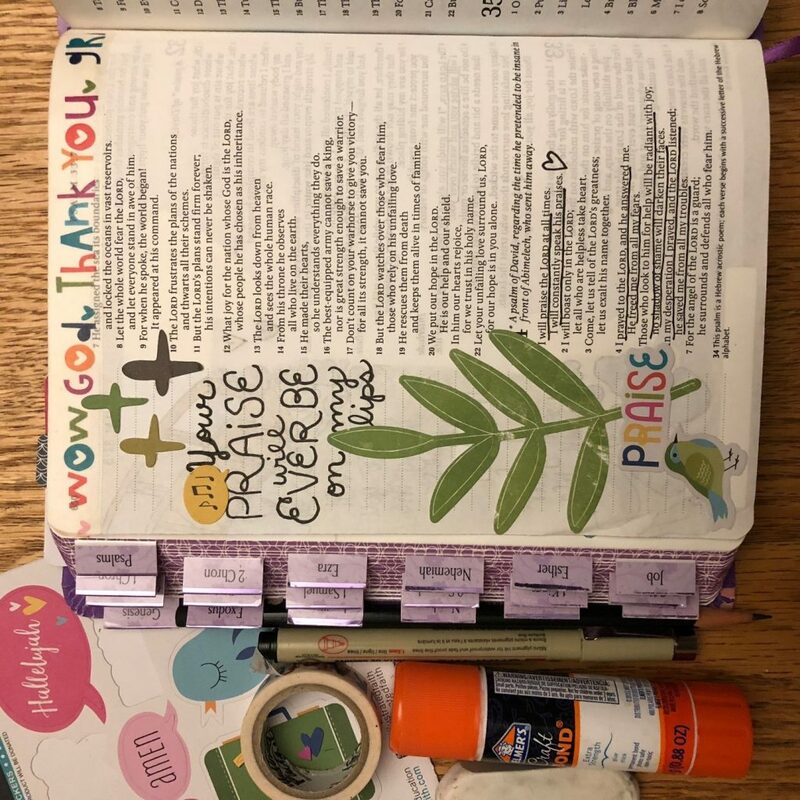 I would like to say that I’ve been journaling for awhile (writing notes and using post its and things like that), for at least 10 – 15 years in my Bibles; but once I found out that it was okay to use paint, stickers, markers and washi tape, etc. I was ecstatic! That part of my journey started in September 2017. 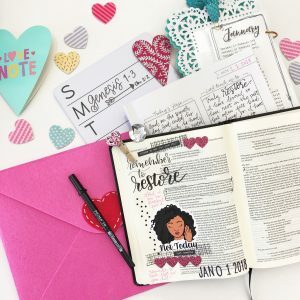 I started taking notes and writing in my Bible for as far back as I can remember; but one day I stumbled upon some YouTube videos of some brilliant ladies who was doing much, much more. 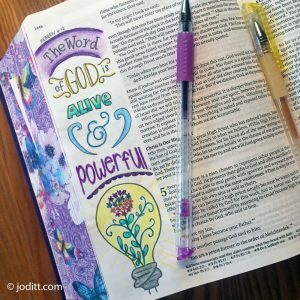 They were using their creative side to journal in their Bibles. 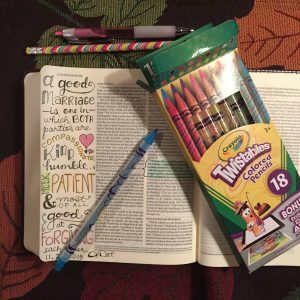 It blew my mind that they were painting, drawing and coloring in their Bibles. I had never seen anything like that before. It was scary and freeing all at the same time. 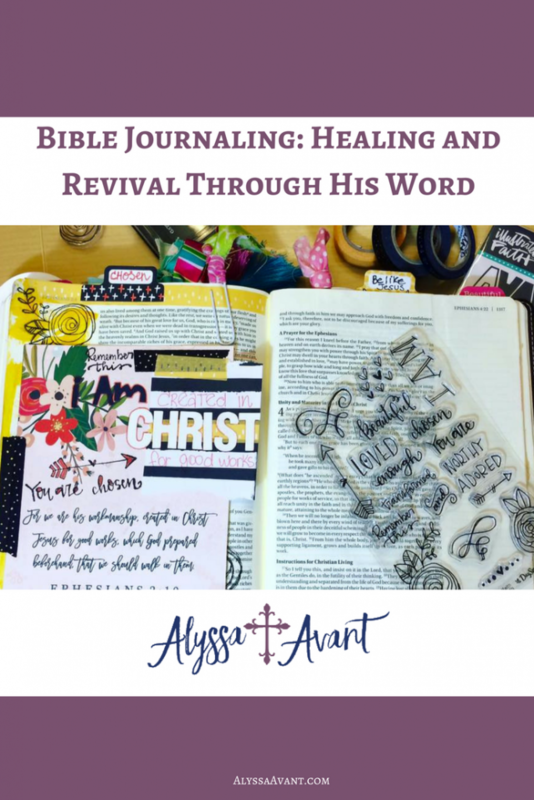 Not long after that I went and purchased my first journaling Bible and the rest, as they say, is history. 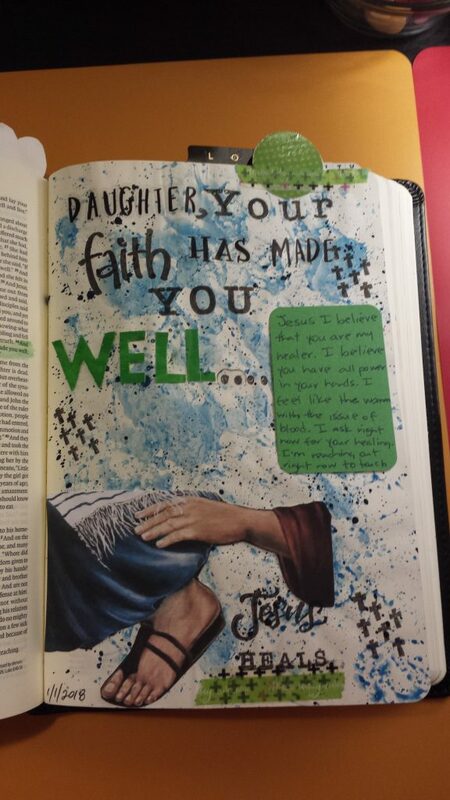 Being able to use my creativity without any hindrances or judgment is my favorite thing about Bible journaling. 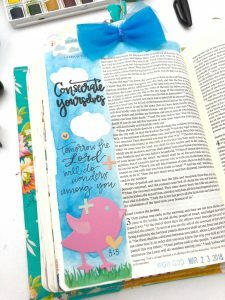 I can do whatever I want to express myself in my Bible to the Lord. There are days I totally mess up, but that’s okay. 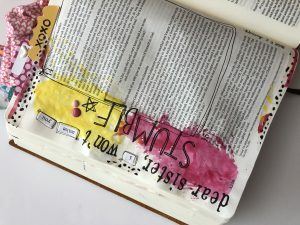 I give myself room to mess up and remove the burden of being perfect and/or trying to make every page a “masterpiece”. 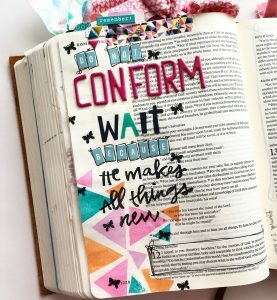 I quickly learned that we are all unique and our journaling styles will not be the same. We are all made differently and we all create differently. 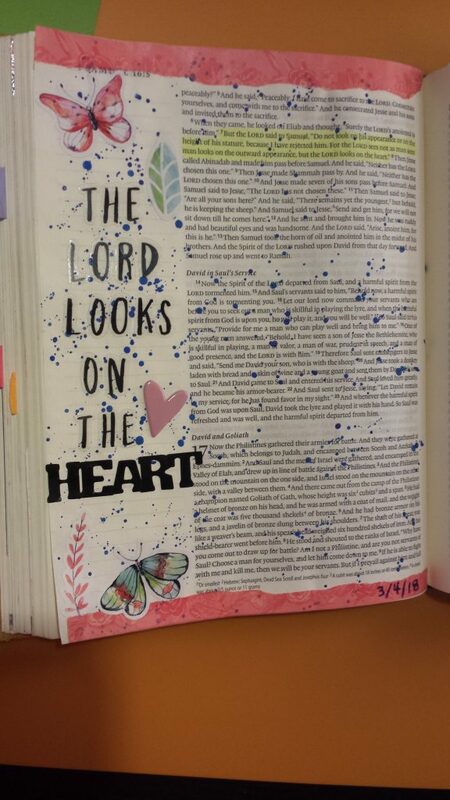 My joy comes from knowing that it’s MY Bible and I don’t have to worry about God giving me a failing grade for using the wrong color paint or mistakenly placing a sticker on backward. 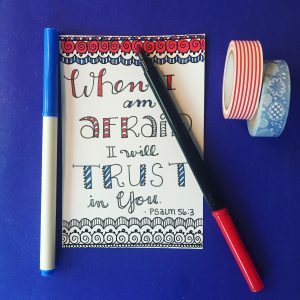 I absolutely adore stickers and washi tape. They are by far my favorites. 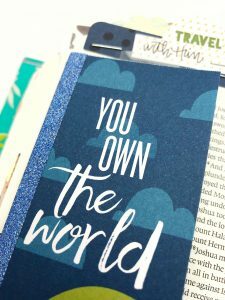 Even when I’m having an uncreative day, I can still put down a couple of stickers, outline the page with a strip of washi and wahla! Both. 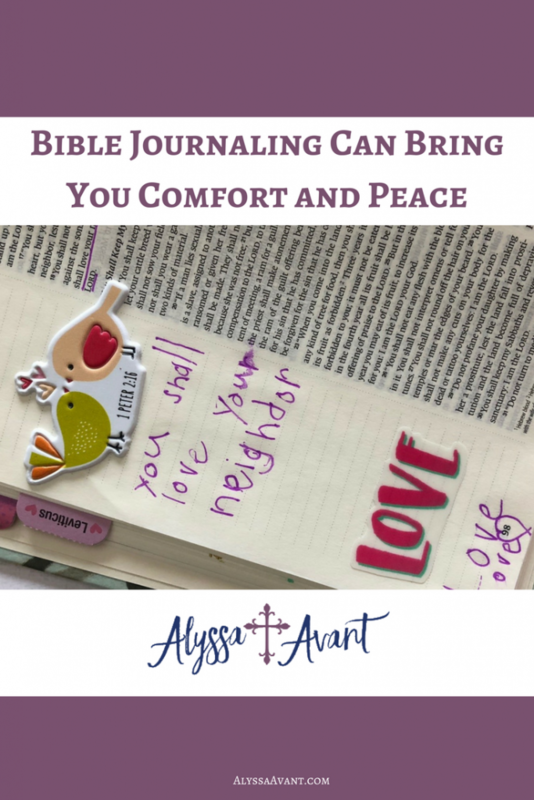 I have a journaling notebook and several journaling Bibles. 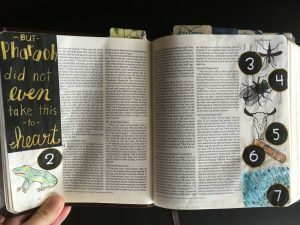 If ever I want to do a spread and it is possibly too big for my Bible or if I just want to do something a little different, I’ll journal in my notebook. 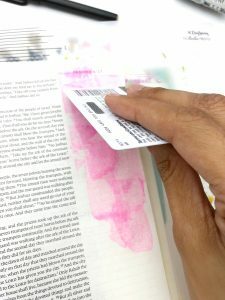 I will still write down scriptures for reference. 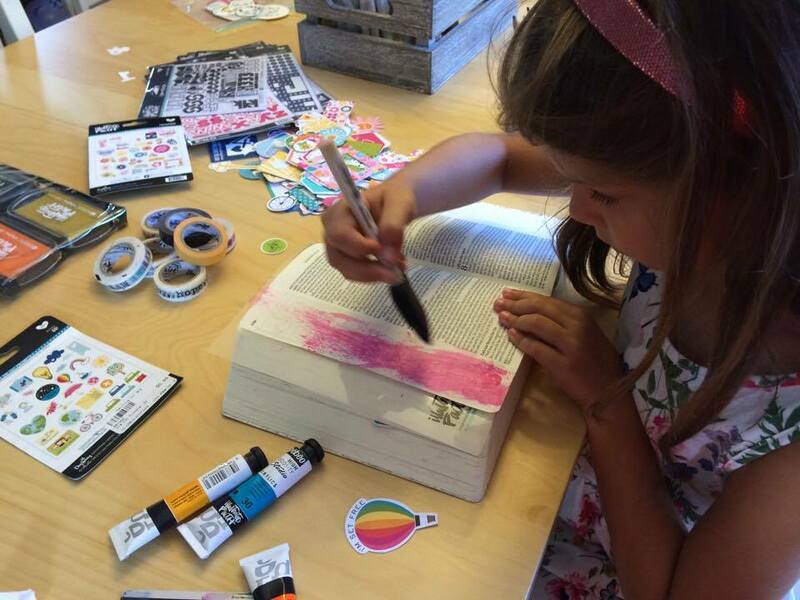 Mixing paint splatter with stickers. That’s one of my go-to processes for adding color to my pages. 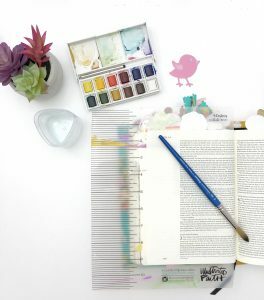 Just take paint on your wet brush and splatter it onto your page. 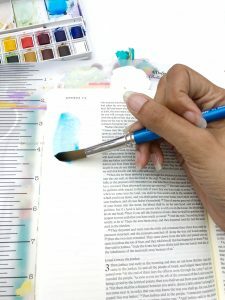 Dry the paint using a heat tool or let it air dry completely. 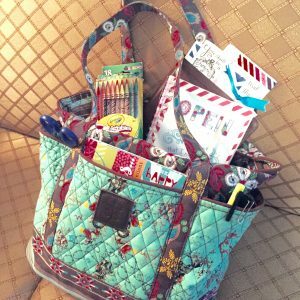 Thereafter, lay down your favorite stickers or washi. 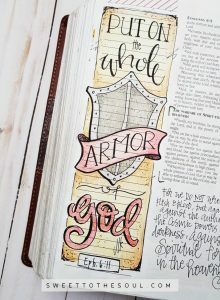 Finally, add some journaling or a prayer and you’re all done! 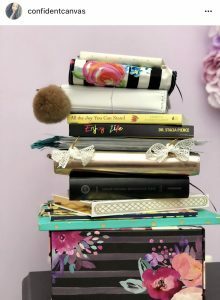 Today’s guest is a wonderful lady I met online through my business as a virtual assistant when we worked together on a mutual client’s book launch. She is such a creative person and has many great ideas. 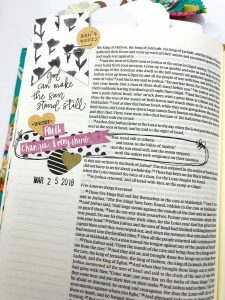 You will learn so much from Jana, the soul inspired Bible journaler. 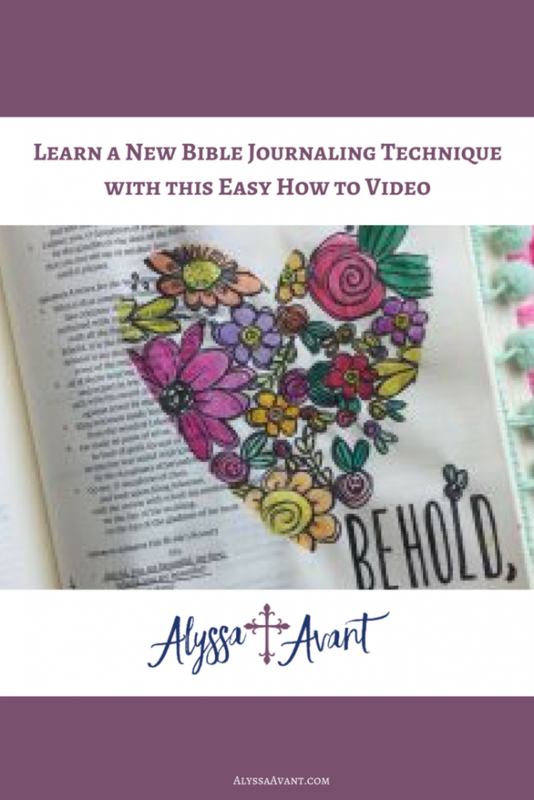 How did you get started Bible Journaling? 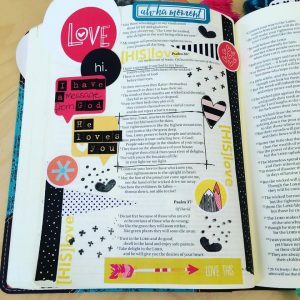 My first journaling pages were just lettering the scriptures and including small illustrations. They were all black and white. Then I began adding color with colored pencils because they have been a long time favorite art medium. 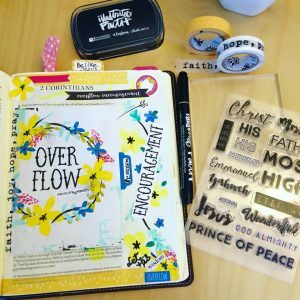 I really jumped in, though, last year after attending a Bible Journaling Retreat. 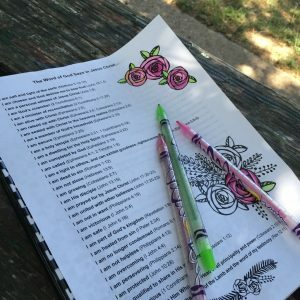 The Retreat was wonderful and connected me with so many wonderful ladies! 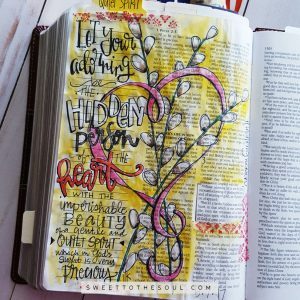 Definitely, it is spending time in the scriptures. 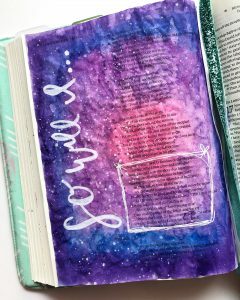 I love being able to combine my love of creativity and my love of God’s Word. It’s a natural fit for me. All time fav is still my pencil and black marker (Micron, Micron, or Sharpie Pen ). But I love painting with a water brush and gelatos or watercolors. Drawing, lettering, and painting are my favorite techniques. 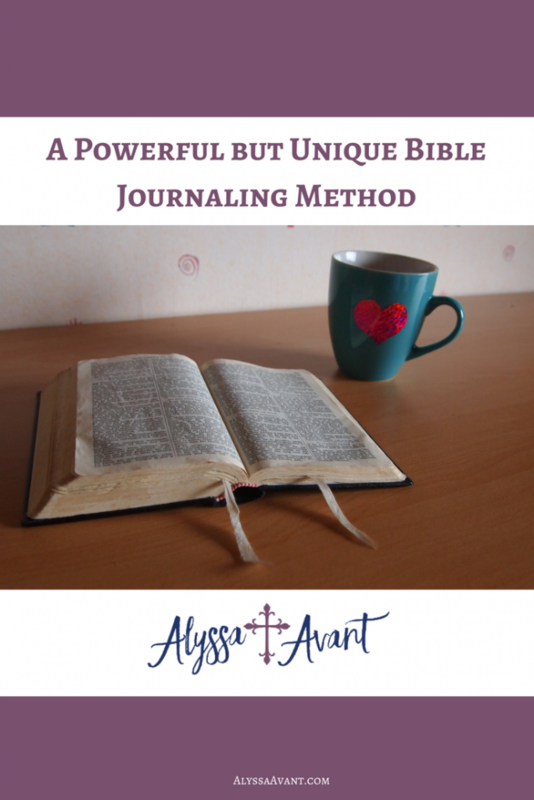 Do you journal in a Bible, blank journal or something else? 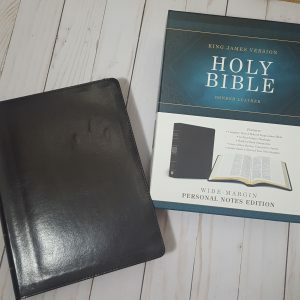 I use a King James Version note-taking Bible by Barbour. 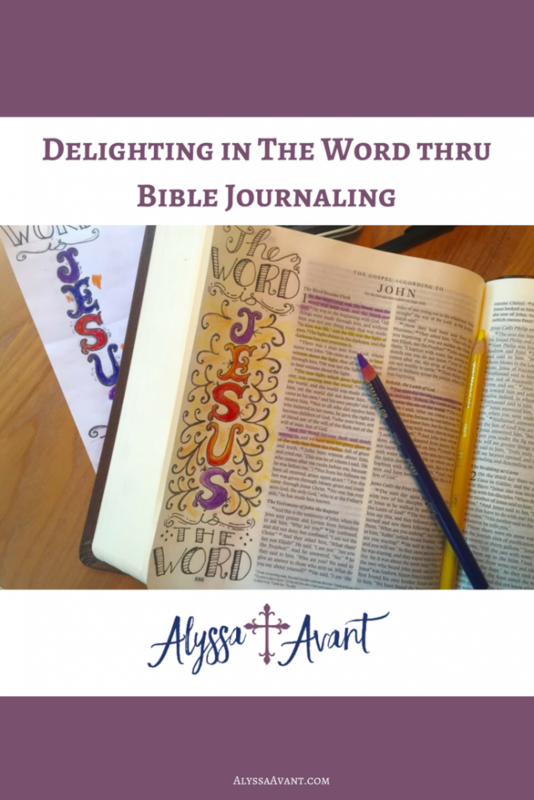 It pre-dates the “journaling” Bibles and has much thicker and larger pages. 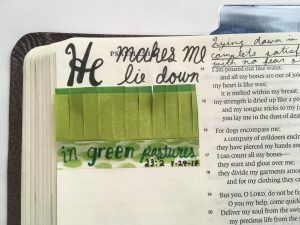 I also have an ESV Single Column Journaling Bible that I am starting to fill in. 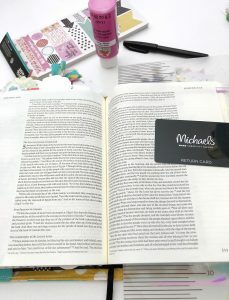 However, I love the note taking Bible so much that I purchased two more! 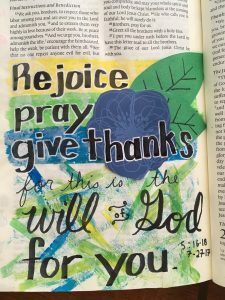 For me, Bible Art Journaling is a form of worship and I believe my inspiration comes from God. 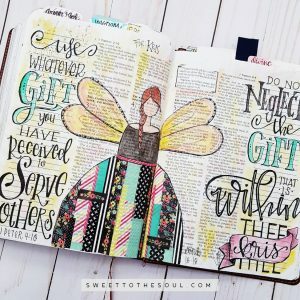 God convicted me several years ago that He had given me a gift and not only was I not using it for the Kingdom, I wasn’t even using it for my pleasure. That may lead you to ask whether God gives us spiritual gifts for our pleasure or His? Well, I believe both. I believe they are meant to be used to glorify God, and in this process, to bring happiness to us as well. 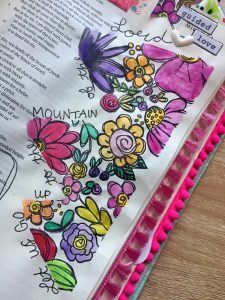 So, I use Bible Journaling and create Scripture Art – yes because it makes me happy – but also to bring God glory and encourage others to spend time in God’s Word. 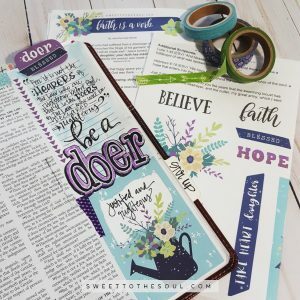 I also share devotions and Bible Studies with Journaling printables and kits. On a bookshelf in my study are several Bibles which previously belonged to other family members. 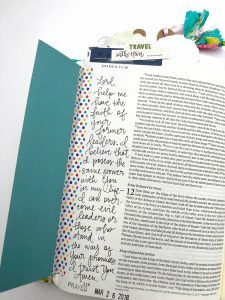 My husband and I both love flipping through the pages of these Bibles and revisiting the handwritten notes of our parents who are no longer with us. 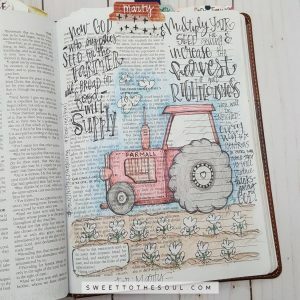 This is another reason I journal in my Bible. One day, I pray that the Word of God and the words of this Nana will also bless the next generation. 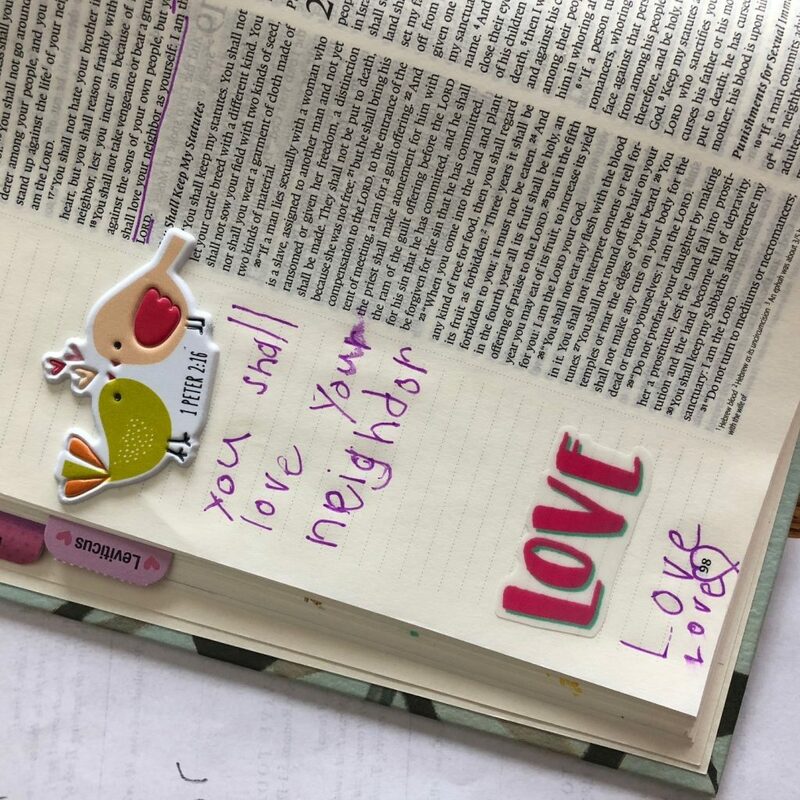 The pages I’m sharing with you today represent different techniques but all focus on my family members. 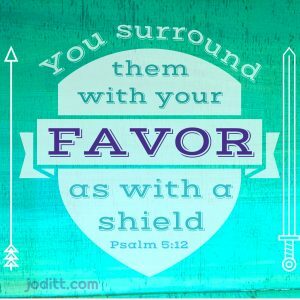 I have selected a scripture to pray over and dedicate to each of my family members. We have a big family so I’m not finished with everyone’s, but these represent a few and each capture the person’s heart, personality or spiritual gifting. 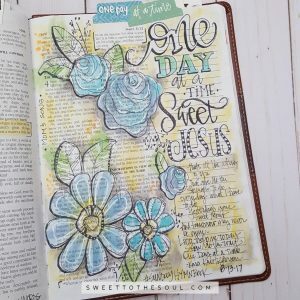 If you have been blessed by the Journaling pages I shared with you today, I would love to invite you to follow me on Instagram at sweettothesoulshoppe. 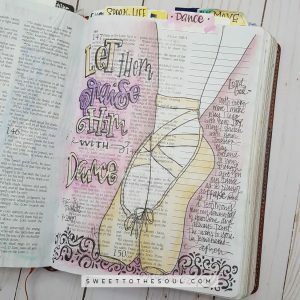 And if you would like to add some Soul Inspired art to your journal or Bible, please visit my shoppe at www.SweetToTheSoulShoppe.com. I accepted Jesus into my heart as my Lord and Savior when I was in 3rd grade. 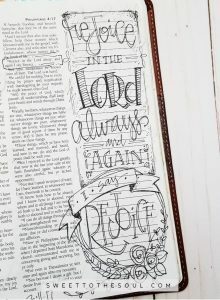 Ever since then I have had a fondness for The Word of God. 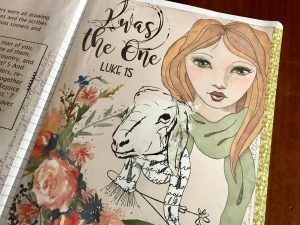 Even as a little girl, I would make and send out my own hand-made greeting cards and Christmas cards, which always included a Scripture. 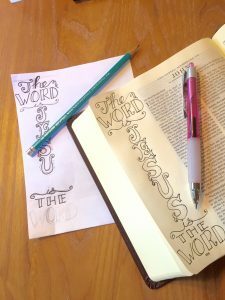 Through the years, I have experienced the power of The Word at work in my life, and therefore, have become even more passionate about it. 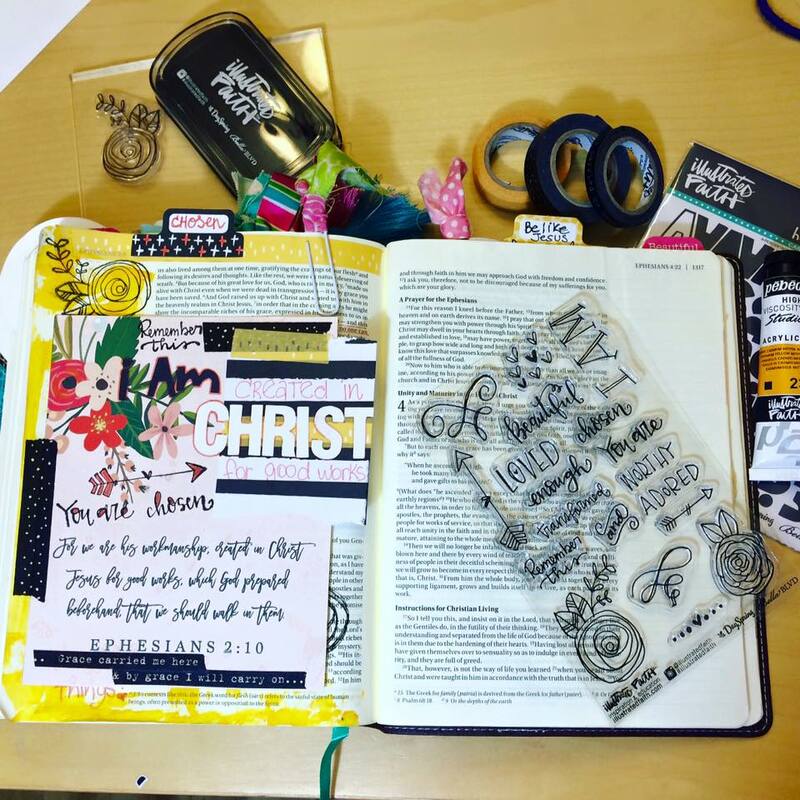 In the 1990s I got into scrapbooking and really fell in love with it. 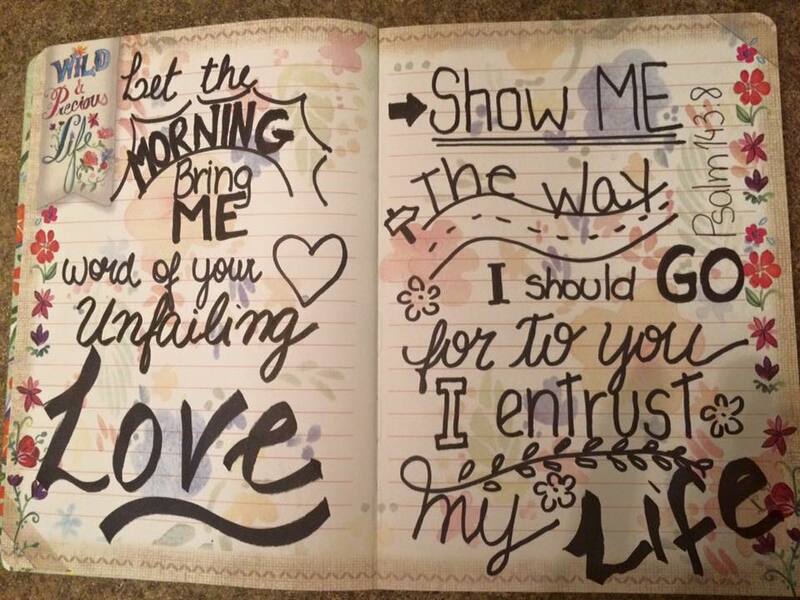 I could scrapbook for hours upon hours. 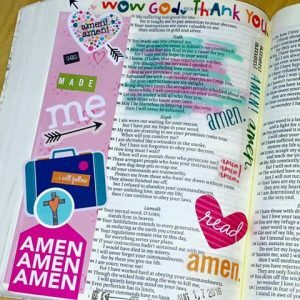 I often included Scripture in my scrapbook pages and also included journaling about my faith and how God was working in our lives. 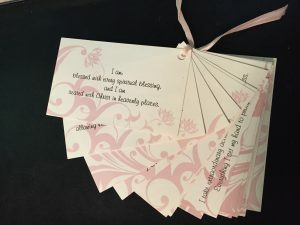 I also made pretty Scripture memory cards and affirmation cards to help me memorize and pray God’s Word. 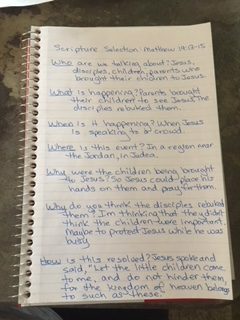 Also, I was homeschooling our children at that time and we did lots of creative activities during our Bible study lessons. Later, I went back to school and graduated with a degree in Visual Communications (which included lots of instruction in graphic design.) 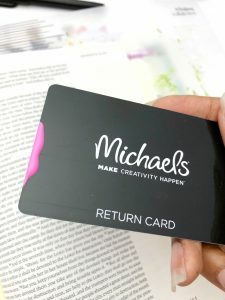 I had always loved doing arts and crafts type stuff but never considered myself an artist because I was never able to draw anything that looked realistic. And I would get frustrated when trying to draw. If I made one little mistake I would have to start all over again. So when I discovered graphic design I fell in love with it because it was so easy to correct mistakes and edit your designs. It was so much easier to me than drawing, and I wasn’t so worried about making a mistake or wasting so much paper and supplies. 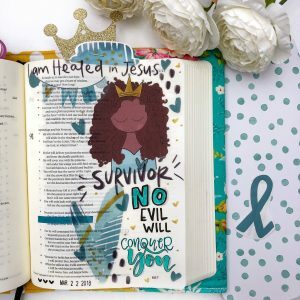 So then I began designing greeting cards, stationery and even Scripture art using my graphic design skills. 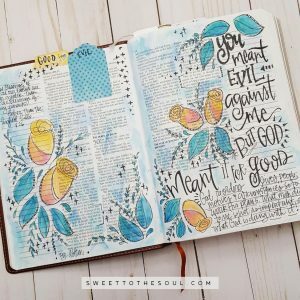 I loved creating things with Scripture because I found that, while doing so, I was hiding The Word in my heart, which helped me have more victory in my everyday life. 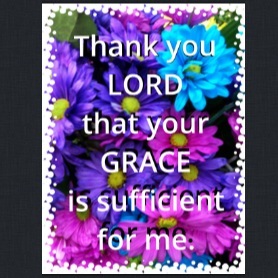 After I got an iPhone I also liked creating Scripture graphics using iPhone apps and setting them as my lock screen. 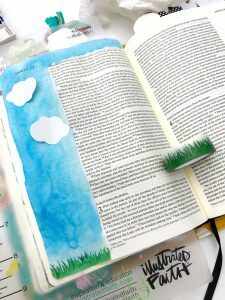 About 4-5 years ago, my Bible study group was studying Psalm 119, which is all about The Word of God. 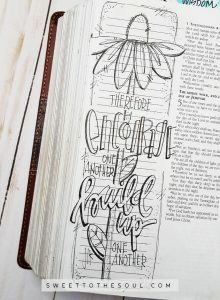 I remember reading verse 47-48 in the Message Bible and thinking, “Now that is how I want to feel about The Word.” This was about the time that hand-lettering was beginning to get popular. I really liked that style of artwork, and I missed the feel of pencil on paper. 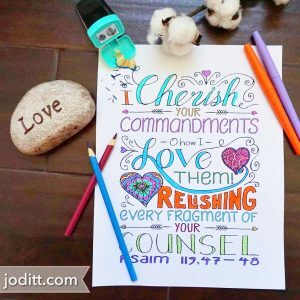 So, I decided to challenge myself to hand-letter Psalm 119:47-48 to help me memorize it. The result is pictured above. It did not turn out as beautiful as the images I had seen on Instagram, but I loved it! And what I loved even more was that, as I was drawing it, it was as if it was being embossed on my heart. 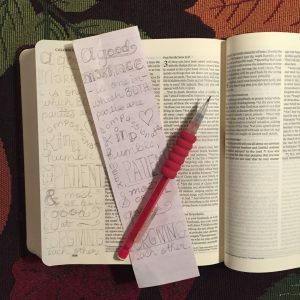 Some Scriptures I have memorized, only to forget them a few years (or a few days) later. 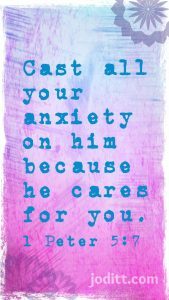 But this Scripture I will never forget. Even today, I can close my eyes and see each word exactly as I had drawn it. 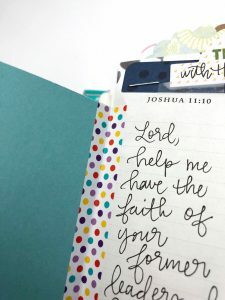 Furthermore, what was even more exciting to me, was that I began to declare this by faith, and every day, little by little, I found myself cherishing Scripture more and more, and falling more in love with The Word of God. 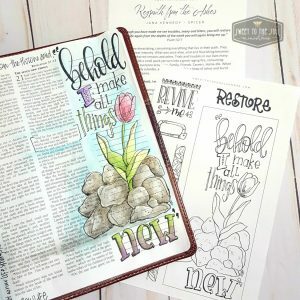 I was hooked and I began hand-lettering more Scriptures. I might use them as a coloring page or scan and save to my computer, then add color digitally. 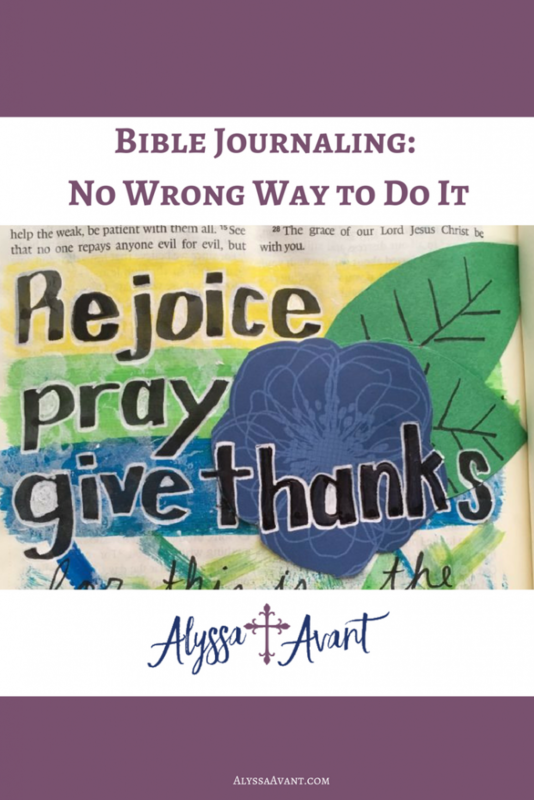 It wasn’t until a year or two later that I actually began doing that kind of thing in my Bible. 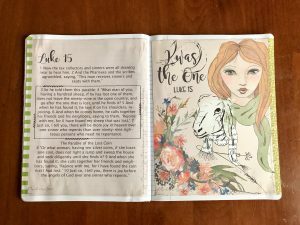 When I first heard about Illustrated Faith and Bible Journaling and saw the beautiful images of decorated Bible pages on Pinterest, my heart skipped a beat. 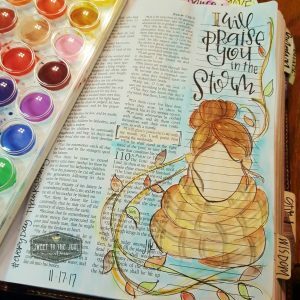 I thought the idea of drawing, coloring, and hand-lettering inside your Bible was a fun and brilliant idea. It was also a scary idea… I mean, what if I made a mistake? I couldn’t just tear the page out and throw it away. 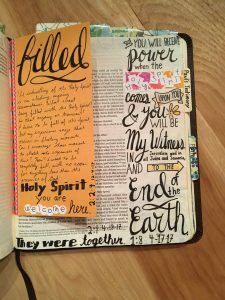 Besides, I didn’t have one of those “journaling” Bibles with the wide margins. 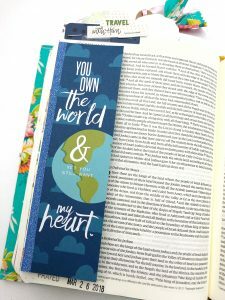 But when a dear friend of mine, who knew I would absolutely LOVE Bible journaling gave me a journaling Bible, (and it wasn’t even my birthday or Christmas), well, I knew that I had to give it a try. 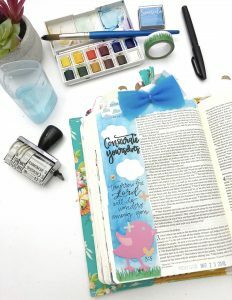 I knew what Scripture I wanted to use for my First Bible Journaling Page – John chapter 1 – because when I discovered that Jesus actually is The Word of God, that changed my perspective and attitude toward the Bible. 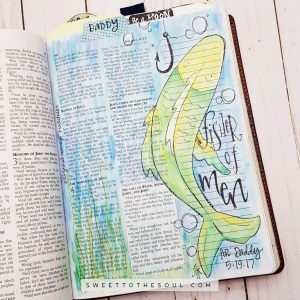 I want to know Jesus more, so the more I get to know the Bible, the better I know Jesus. Above are photos of my first page. It is not perfect and I wish I would have left off a few of the extra embellishments. But that’s OK. It is part of my faith journey. 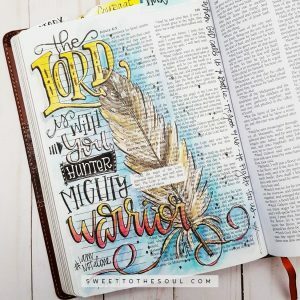 I would have to say that my favorite technique is hand-lettering because I find that it helps me memorize or “hide” the Scripture in my heart best. 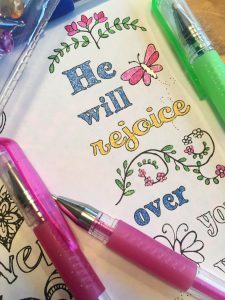 I like to then add color using colored pencils or watercolor pencils and glitter gel pens. Oh, and I love to use eyeshadow for soft, airy backgrounds. I just rub it on with a cotton swab or a cotton ball for larger areas. It takes less time to fill in the backgrounds this way. Plus, it leaves a softer, smoother texture, which I like. 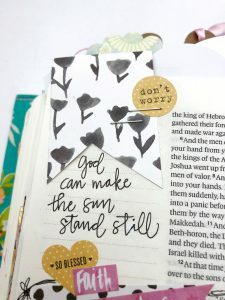 I do Bible journaling in my Bible, and in an art journal, but I also like to do it on cards with pretty borders, which I place in various places around my house, car & office to help meditate on Scripture even when my Bible is not open. 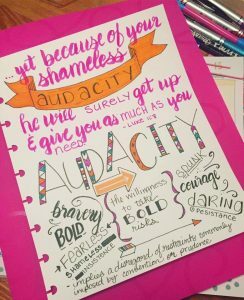 I also try to add some color and creativity to my sermon notes. Also, I live in an RV, and therefore, have very limited space. 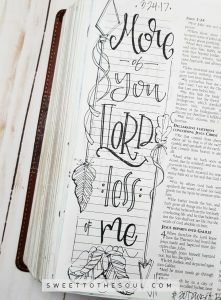 That is another reason that I choose to do hand-lettering and drawing in my Bible, rather than using a lot of different supplies and tools. 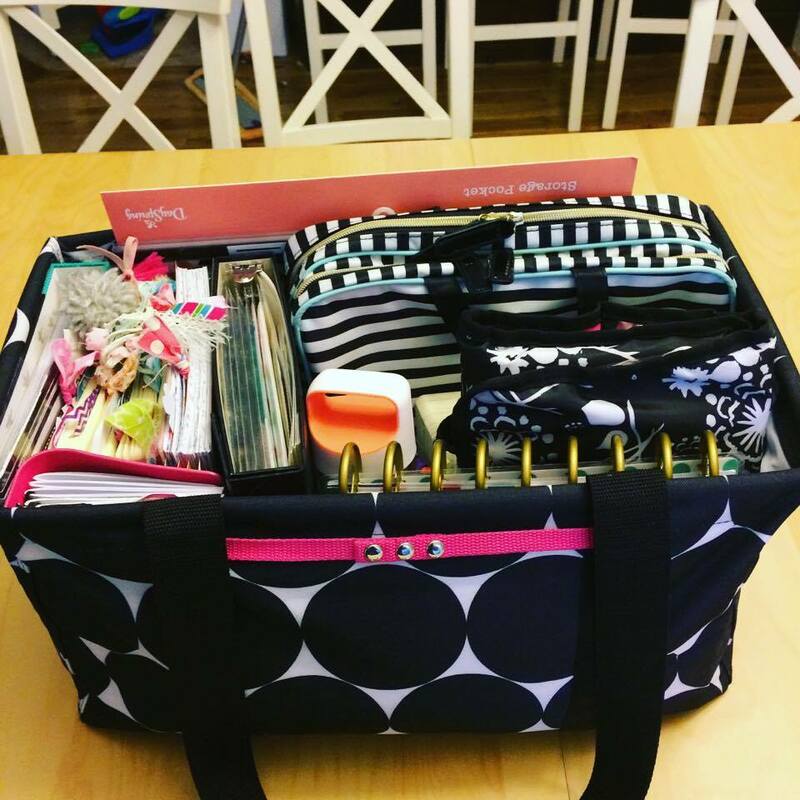 All of my Bible journaling supplies fit in a tote bag. 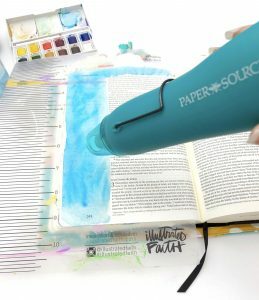 That way I can easily do Bible journaling at my kitchen table, or outside on the patio table, or while sitting in my bed. But hand-lettering does take more time and energy. I have discovered that I prefer to just color in already drawn illustrations on days when I am really tired or lacking energy and/or focus. 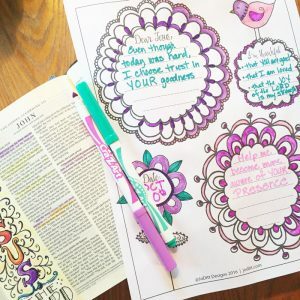 Often, at bedtime, I like to color in a Scripture coloring book or in a coloring Bible. 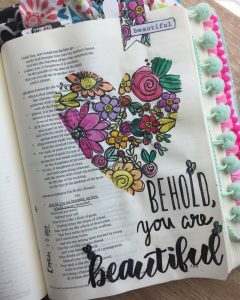 I just recently purchased the Praise Inspire Bible and I am really enjoying coloring in it. 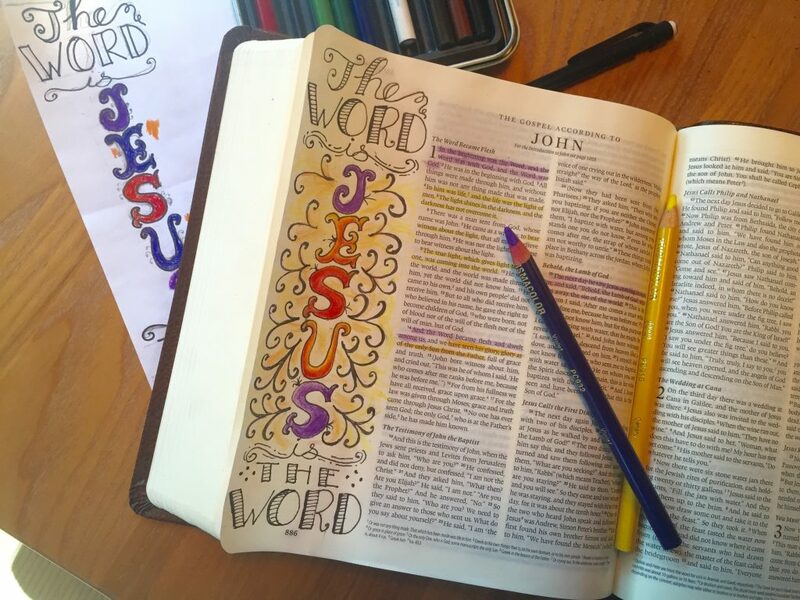 I find that putting on some worship music or a Bible teaching and coloring in my Bible is quite relaxing and helps me to unwind at the end of long day. Then I continue meditating on and picturing in my mind the Scripture as I drift off to sleep. I encourage you to try different techniques and find what works for you and what you enjoy most.